Early this month I set out to try to improve the Debian support for pluggable hardware devices. Now my prototype is working, and it is ready for a larger audience. To test it, fetch the source from the Debian Edu subversion repository, build and install the package. You might have to log out and in again activate the autostart script. 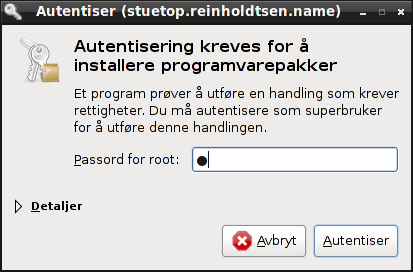 Add desktop entry in /usr/share/autostart/ causing a program hw-support-handlerd to start when the user log in. This program listen for kernel events about new hardware (directly from the kernel like udev does), not using HAL dbus events as I initially did. When new hardware is inserted, look up the hardware modalias in the APT database, a database available via HTTP and a database available as part of the package. If a package is mapped to the hardware in question, the package isn't installed yet and this is the first time the hardware was plugged in, show a desktop notification suggesting to install the package or packages. If the user click on the 'install package now' button, ask aptdaemon via the PackageKit API to install the requrired package. aptdaemon ask for root password or sudo password, and install the package while showing progress information in a window. I still need to come up with a better name for the system. Here are some screen shots showing the prototype in action. First the notification, then the password request, and finally the request to approve all the dependencies. Sorry for the Norwegian Bokmål GUI. The prototype still need to be improved with longer timeouts, but is already useful. The database of hardware to package mappings also need more work. It is currently compatible with the Ubuntu way of storing such information in the package control file, but could be changed to use other formats instead or in addition to the current method. I've dropped the use of discover for this mapping, as the modalias approach is more flexible and easier to use on Linux as long as the Linux kernel expose its modalias strings directly. Update 2013-01-21 16:50: Due to popular demand, here is the command required to check out and build the source: Use 'svn checkout svn://svn.debian.org/debian-edu/trunk/src/hw-support-handler/; cd hw-support-handler; debuild'. If you lack debuild, install the devscripts package. Update 2013-01-23 12:00: The project is now renamed to Isenkram and the source moved from the Debian Edu subversion repository to a Debian collab-maint git repository. See build instructions for details.